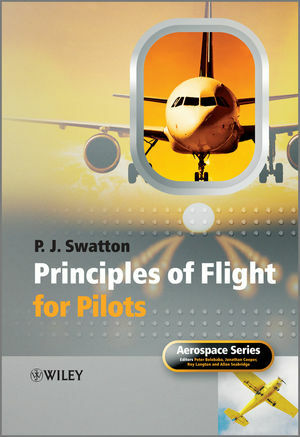 Organised and written as an accessible study guide for student pilots wishing to take commercial ground examinations to obtain ATPL or CPL licenses, Principles of Flight for Pilots also provides a reliable up-to-date reference for qualified and experienced personnel wishing to further improve their understanding of the Principles of Flight and related subjects. Providing a unique aerodynamics reference tool, unlike any book previously Principles of Flight for Pilots explains in significant depth all the topics necessary to pass the Principles of Flight examination as required by the EASA syllabus. Aviation ground instructor Peter J. Swatton, well reputed for his previous works in the field of pilot ground training, presents the subject in seven parts including basic aerodynamics; level flight aerodynamics; stability; manoeuvre aerodynamics; and other aerodynamic considerations. Each chapter includes self-assessed questions, 848 in total spread over eighteen chapters, with solutions provided at the end of the book containing full calculations and explanations. Peter Swatton is Director and Chief Ground Instructor at Ground Training Services at Bournemouth/Hurn airport which specialises in training pilots for the JAA examinations. He was a navigator in the Royal Air Force for 37 years, of which 28 were spent as an OCU instructor and Wing examiner: on retirement he became an instructor with the Professional Pilot Study Centre at Bournemouth and remained there for 12 years before assuming his current role. 1.2 The Composition of Air. 1.3 The International Standard Atmosphere. 1.4 The Physical Properties of Air. 1.5 Newton's Laws of Motion. 1.7 The Equation of Impulse. 1.8 The Basic Gas Laws. 1.11 The Equation of Continuity. 2.8 The Effect of Altitude on Airspeeds. 3.1 Aeroplane Axes and Planes of Rotation. 3.8 Asymmetric Engine Yawing Moment. 4.4 The Laminar Boundary Layer. 4.5 The Turbulent Boundary Layer. 4.10 The Centre of Pressure (CP). 5.4 The Factors Affecting Cl. 5.5 The Effect of Angle of Attack. 5.6 The Effect of the Wing Shape. 5.7 The Effect of Airframe-Surface Condition. 5.8 The Effect of Reynolds Number. 5.9 The Relationship between Speeds, Angles of Attack and Cl. 7.8 The Coefficient of Induced Drag (Cdi). 7.10 Analysis of the Total-Drag Curve. 7.11 The Velocity of Minimum Drag (Vimd). 7.12 The Velocity of Minimum Power (Vimp). 7.13 The Maximum EAS/Drag Ratio (Vi/Dmax) Speed. 7.14 Speed Stability and Instability. 7.15 The Effect of the Variables on Total Drag. 7.16 The Cl v Cd Polar Diagram. 7.17 Analysis of the Lift/Drag Ratio. 8.3 The Low-Speed Stalling Angle. 8.4 Factors Affecting the Low-Speed Stalling Angle. 8.5 The Effect of Wing Design on the Low-Speed Stall. 8.9 Summary of Factors Affecting the Stalling Angle. 8.13 Factors Affecting Stalling Speed. 8.14 Centre of Gravity (CG). 8.20 Summary of Factor Effects on Stalling Speed. 8.22 The Effect of a Gust on the Load Factor. 9 Thrust and Power in Level Flight. 9.2 Analysis of the Thrust Curves. 9.3 The Effect of the Variables on Thrust. 9.5 Analysis of the Power Curves. 9.6 The Effect of the Variables on Power. 10.1 Wing Torsion and Flexing. 11.2 The Effect of the Variables on Static Stability. 11.5 The Directional Restoring Moment. 11.6 Aeroplane Design Features Affecting Directional Static Stability. 11.8 Neutral Directional Static Stability. 11.10 Aeroplane Design Features Affecting Lateral Static Stability. 11.11 Sideslip Angle and Rolling Moment Coefficient. 11.12 Analysis of Design Feature Effects. 11.18 The Centre of Pressure (CP). 11.19 The Neutral Point (NP). 11.20 The Aerodynamic Centre (AC). 11.21 The Centre of Gravity (CG). 11.22 The Static Margin (SM). 11.23 The Trim Point (TP). 11.26 The Effect of the Variables on Longitudinal Static Stability. 11.27 Stick-Fixed Longitudinal Static Stability. 11.28 Stick-Free Longitudinal Static Stability. 11.29 Certification Standard Stick-Force Requirements. 11.30 The Effect of CG Position on Stick Force. 11.31 Longitudinal Static Manoeuvre Stability. 11.32 Factors Affecting Stick Force. 11.34 The Effect of Atmospheric Conditions. 11.35 The Factors Affecting Static Stability. 12.8 The Factors Affecting Dynamic Stability. 13.3 Stalling and Design Speed Definitions. 13.6 The Gust Load Factor. 13.8 The Buffet Onset Boundary Chart. 13.10 Turn and Slip Indications. 14 Climb and Descent Aerodynamics. 14.2 The Forces in a Climb. 14.3 The Effect of the Variables on the Climb. 14.12 Vy at the Absolute Ceiling. 14.13 The Effect of the Variables on Vx and Vy. 14.14 The Effect of Climbing-Speed Variations. 14.15 Factors Affecting the Climb. 14.17 Gliding for Maximum Range. 14.18 The Effect of the Variables on a Glide Descent. 14.19 Gliding for Maximum Endurance. 14.20 Climbing and Descending Turns. PART 6 OTHER AERODYNAMIC CONSIDERATIONS. 15.5 The Shockwave Deflection Angle. 15.7 Critical Mach Number (Mcrit). 15.8 The Effect of a Shockwave. 15.10 The Effect of the Aerofoil Profile. 15.12 The Effect of Sweepback. 16.3 Factors Affecting Propeller Efficiency. 16.6 The Effects of a Propeller on Aeroplane Performance. 16.7 Propeller Forces and Moments. 16.9 The Constant-Speed Unit (CSU). 16.10 The Effect of a Constant Speed Propeller On a Glide Descent. 17.2 The Effect of Runway Contamination. 18.12 The Effect of the Variables on Performance. 19 Solutions (with page references).